cinema d’amore /ˈsinəmə dəˈmōrē/ n. 1. Three cinephiles exploring all that film and television have to offer. In Episode 95, we conclude our Childhood Terrors theme with the Witches (Nicholas Roeg, 1990). Hosted by Justin Morgan. Co-Hosted by James Reinhardt. Mixing and QA by Scratchin’ Menace with Music by Daniel Birch and Ben Pegley. Available on Apple Podcasts, Google Play, and Spotify. Please subscribe, rate and review us. Every little bit helps, and more importantly, thank you for listening. In Episode 94, we continue our Childhood Terrors theme with Poltergeist (Tobe Hooper, 1982). Hosted by Charles Phillips. Co-Hosted by Justin Morgan and James Reinhardt. Mixing and QA by Scratchin’ Menace with Music by Daniel Birch and Ben Pegley. We discuss Pet Sematary (Mary Lambert, 1989) and Pet Sematary (Kevin Kölsch and Dennis Widmyer, 2019). Hosted by Justin Morgan and James Reinhardt. Mixing and QA by Scratchin’ Menace with Music by Daniel Birch and Ben Pegley. In Episode 93, we begin our Childhood Terrors theme with Return to Oz (Walter Murch, 1985). Hosted by James Reinhardt. Co-Hosted by Justin Morgan and Charles Phillips. Mixing and QA by Scratchin’ Menace with Music by Daniel Birch and Ben Pegley. We discuss Shazam! (David Sandberg, 2019). Hosted by Justin Morgan and James Reinhardt with Guests Lexy Behl and Kevin Carlson. Mixing and QA by Scratchin’ Menace with Music by Daniel Birch and Ben Pegley. In Episode 92, we explore Us (Jordan Peele, 2019). Hosted by Justin Morgan and Charles Phillips. Mixing and QA by Scratchin’ Menace with Music by Daniel Birch and Ben Pegley. In Episode 91, we conclude our exploration of the Early Films of Quentin Tarantino with Kill Bill (Quentin Tarantino, 2003, 2004). While each volume of Kill Bill primarily explores a different genre, Tarantino considers it to be a single film, as do we, hence the singular title of 'Kill Bill' in the episode title. Hosted by Justin Morgan. Co-Hosted by Charles Phillips and James Reinhardt. Mixing and QA by Scratchin’ Menace with Music by Daniel Birch and Ben Pegley. In Episode 90, we continue our exploration of the Early Films of Quentin Tarantino with Jackie Brown (Quentin Tarantino, 1997). Hosted by Justin Morgan. Co-Hosted by Charles Phillips with Guest Shawn Shelpman. Mixing and QA by Scratchin’ Menace with Music by Daniel Birch and Ben Pegley. We discuss Captain Marvel (Anna Boden and Ryan Fleck, 2019). 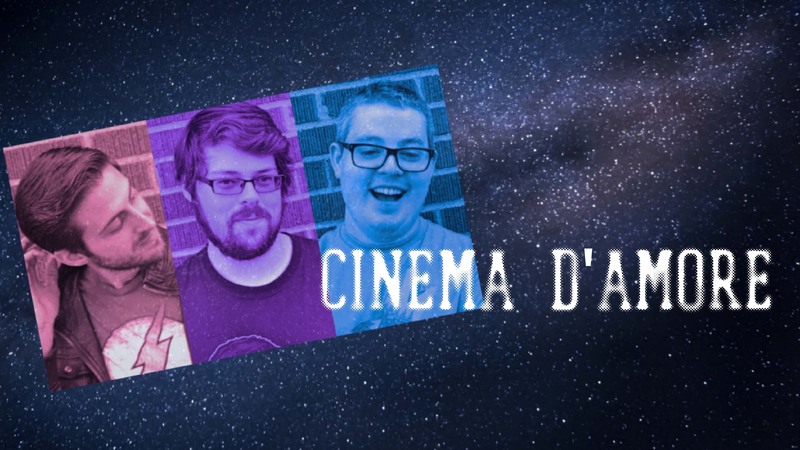 Cinema D’Amore recorded this special Marvel Cinematic Universe episode in two separate sessions, and combined them into a single episode. Part 1 begins with Host James Reinhardt and Guest Lexy Behl, while Part 2 (which starts at the 01:16:00 timestamp) consists of Hosts Justin Morgan and Charles Phillips. Mixing and QA by Scratchin’ Menace with Music by Daniel Birch and Ben Pegley. In Episode 89, we continue our exploration of the Early Films of Quentin Tarantino with Pulp Fiction (Quentin Tarantino, 1994).